Love my Dolce & Gabbana outfit against the purple background of one of Kenny's canvases. Suzy Slesin, the genius publisher of my book and her gorgeous daughter, Lucie. Ali Cordero Casal, Gabriel Rivera-Barraza and Mexican friends. Even the amazing designer and architect, legend Gaetano Pesce, came to the party. Beyond honored. With Brazilian curator and editor, Nessia Pope. I was happily overwhelmed by the amount of friends who came to celebrate the launch of my book "Out There: Design, Art, Travel, Shopping" published by Pointed Leaf Press. I'm so grateful that Paul Kasmin hosted the party in his 27th Street gallery. 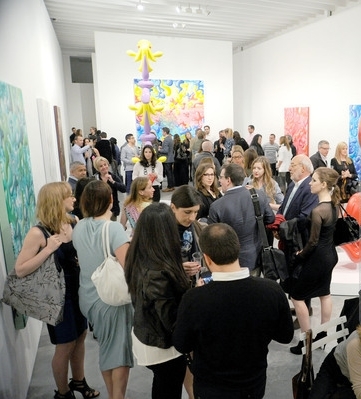 Another reason to be grateful was that Kenny Scharf's latest show called "Kolors" was up and the father of Pop Surrealism himself came to celebrate with us (Kenny and his art are featured in my book and I have been a fan of his work for many years). Billy Farrel, of course, took the best pictures, check here for more!